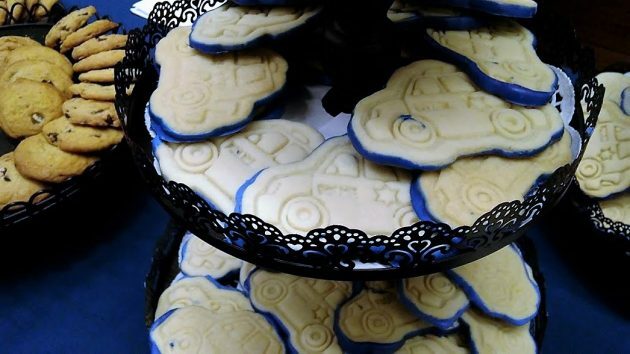 Baked for the occasion by a City Hall staffer, these delicious cookies were one highlight of Friday’s dedication. 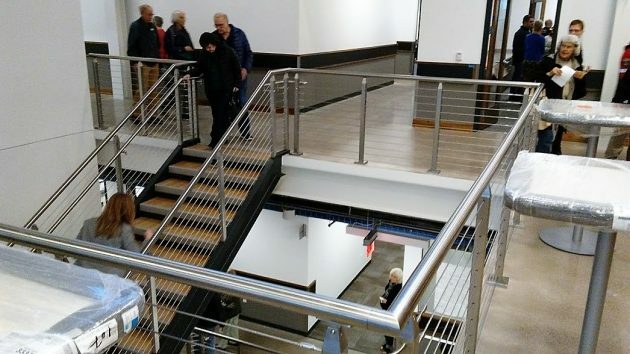 All sharp angles and flat surfaces with clean lines — that’s the just-the-facts impression left by Albany’s new $15.5 million headquarters of the city police. 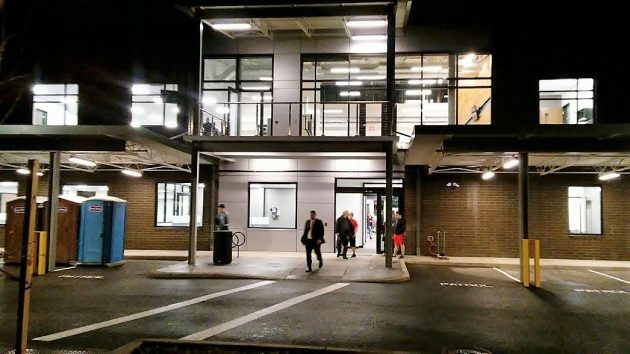 A crowd showed up Friday to sit on folding chairs in the station’s covered sallyport or stand in the back and watch the dedication. When the speeches and numerous thank-yous were over, everybody got up and wandered through the building. The station is not quite ready. Some of the furniture has yet to be unpacked and set up. Wiring still dangles from the ceiling in the rooms where interviews will take place. The police say it will all be finished by Dec. 4, when the department’s administration hopes to move in. Here’s some of what I saw as I wandered around. The front of the station Friday afternoon. The address is 2600 Pacific Blvd S.W. 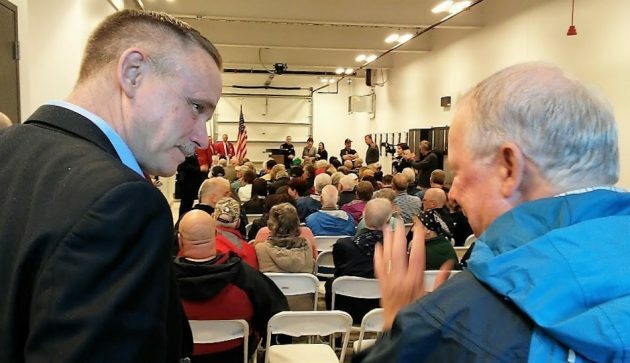 City Manager Peter Troedsson, left, chats with his predecessor, Wes Hare, while at the other end of the room Chief Mario Lattanzio, Mayor Sharon Konopa and others prepare to start the dedication. 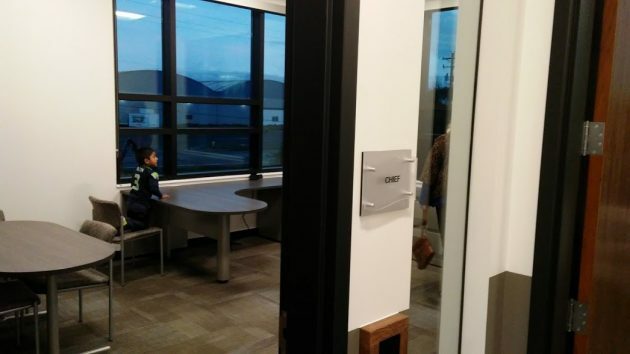 A young visitor checks out the view from the police chief’s corner office. 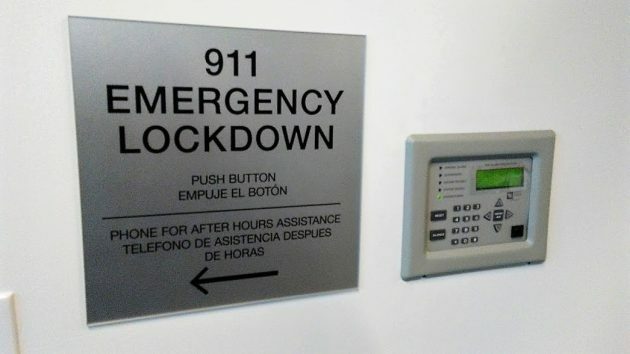 In an emergency after hours, you can lock yourself in the station’s entry and summon an officer for help. The open central stairwell in the two-story building. The public lobby. Don’t count on cookies after the station becomes operational next month. Night had fallen by the time the dedication wound down. This is the station’s back door, reserved for officers and employees. 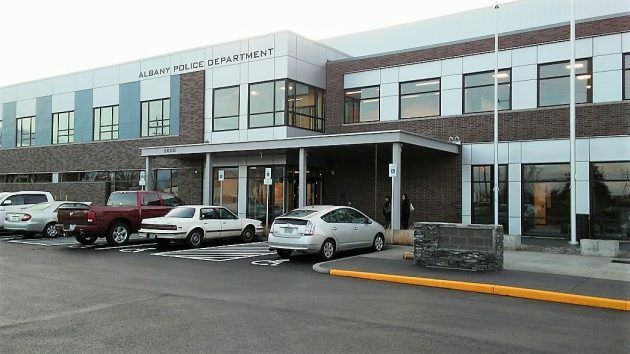 In case anyone forgot, the station is one half of Albany’s public-safety building program for which voters approved an $18 million bond issue. The other half was Station 11, the central fire station completed in September at a cost of $10.2 million. I am very happy for the Police Department. Truly I am. My only concern is that when I saw the raise in my taxes of $425 in one jump I wondered how long we are going to be able to stay in Oregon with this high of property taxes. What are people on a fixed income to do, having cut back on everything possible, it is just getting harder and harder to afford. So I think that Oregon is becoming very retirement unfriendly and I think that is not good for the economy. Also, I have heard that only 20% of the registared voters voted on this bond. There are numerous reasons that there was only a 20% voter participation, but should that be enough to pass a super expensive bond like this. In Europe, if 50% of the voters do not vote, they have to run the campaign over again, as they consider a non vote to be a vote with your feet vote and have to re-do it. Just a thought. Thank you for your time. +1 on Sandi Foster’s post above. Glad for the APD – Sad for fixed income folks and those who’s static wages amount to the same. Albany is becoming increasing expensive for it’s tax paying citizens. I was very surprised and saddened when the last bond was passed and I personally do not know one person who voted for it. Afraid to do anything to improve my house as it just winds up costing too much and I don’t mean the price of supplies from home depot. Edit * The last bond was the school bond…. Thats what I was thinking of …Thanks for the correction Ray Kopczynski. …Either way though my sentiment is the same. 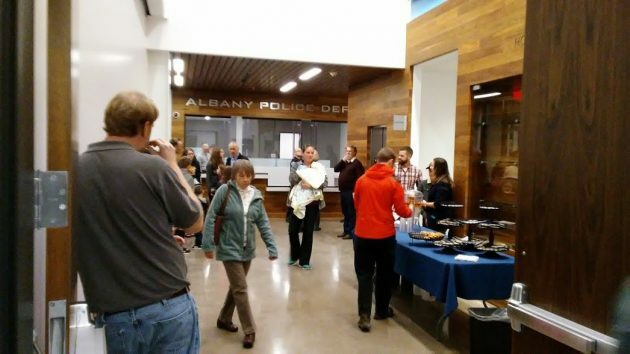 Please ….NO MORE BONDS for Albany we’re paying enough already! Your photos are great. We were unable to attend the event so your coverage was much appreciated. While your taxes (and mine!) rose, speak of apples & apples… In addition to the property taxes going up by fiat of the Linn Co. Tax Assessor’s office, the most recent bond was the GAPS school bond – NOT the bond for the very long overdue Police & Fire facilities. I’m also on a fixed income; a lot of us are, even those working at low-paying jobs. I’m retired. I agree that measures with extremely low voter turnouts should not be considered passed. I don’t know how many more Albany bond measures some of us can withstand. Yes, Oregon has no sales tax, which is very backward thinking nowadays. I have always voted against sales taxes, but if I had a chance to vote on a well-planned sales tax, I would vote yes. Sales taxes are fairer than running old folks out of their homes due to high property taxes. All the while, 45 and the RETHUGs in power want to LOWER TAXES for the well-to-do and corporations. $159 million GAPS bond had very little to do with D.C., this was a community credit card. alright, I may have been a bit reactionary to the comment section. If you take those thoughts one must certainly admit we are chatting about the pocket book. Yours, mine, our fellow ‘Americans. What a perfect cross with the latest GOP/45 tax scam. Taxes where getting to expensive anyway So i Moved to Nevada two months ago. And the chief gets a corner office.